Up for something a little different this weekend? Fancy yourself a master of the District streets? What about at night? With people chasing you? Then sign up for a new type of race: Journey to the End of the Night. Journey to the End of the Night is a race through the streets of DC. You will try to make it to six checkpoints as fast as you can, while avoiding being caught by chasers. Those who survive will be praised and feted at the end. Those who fall will become chasers themselves, rising to pursue their former friends and allies. 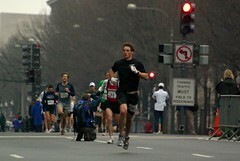 The race begins on Saturday, May 2, at 7:30 PM at Dupont Circle. This is a footrace–only your own two feet and the metro are permitted. No bicycles, no skates, no cars, no taxis. This race is for you, your fellow players, and the city itself. Register here. Can you survive to the end?